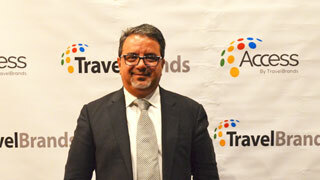 Frank DeMarinis, CEO and President of TravelBrands. 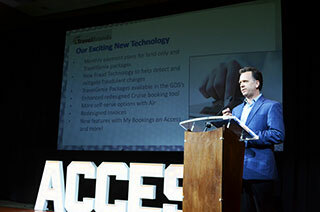 Bruce Lidberg, TravelBrands Director of Sales for Western Canada, presenting the company's new tech enhancements. Gina Marcone (second from right) accepting her 1 million Loyalty Points. 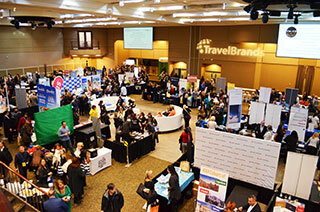 More than 70 exhibitors participated in the TravelBrands Agent Appreciation Event in Toronto. Travel consultants with All Ways Travel. 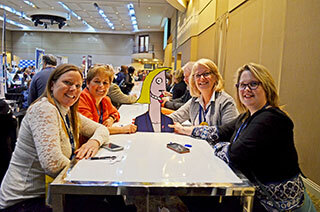 Clockwise from bottom left: Terri Dion, Heather Blaney, Jan Seymour and Melissa Coulter posing with OJ's Tina The Travel Agent. Travel consultants with Travel Plus at the Saint Lucia Tourism Authority's Rod Hanna. Carnival's Business Development Director, Marilisa De Simone. 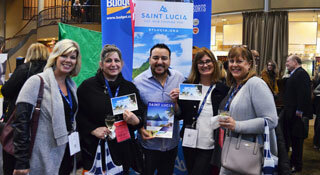 TravelBrands hosted hundreds of agents and more than 70 exhibitors at its fourth annual Agent Appreciation Event 2019 in Toronto, where the company unveiled a series of tech enhancements to its platform and products. Bruce Lidberg, Director of Sales for Western Canada with TravelBrands, outlined the new tech offerings, some of which are already live while others will launch in the near future. Clients will have access to their itinerary through an app, which they can also use to view and add product to their file. Any items added through the app get credited to the original bookings agency. Travelbrands will offer a new software tool that rates a booking’s perceived level of fraudulence. “We think it’s something that agents will really appreciate and it’s just going to give them that much more security and knowledge when they’re booking with TravelBrands,” said Lidberg. Over the coming weeks, TravelBrands will be putting a big focus on its “Bucket List Vacations” promo campaign, which highlights a wide variety of excursions, attractions and adventures that agent will be able to share with their databases. With TravelBrands being acquired by H.I.S-Red Label Vacations Inc. earlier this year, DeMarinis reassured agents that apart from ownership, nothing else will change. “I am remaining on as President/CEO to act in the best interest of all travel agents in Canada. My understanding, my beliefs, my passion and my love that I have for the industry will continue to bring value to the agency level,” he told Open Jaw. DeMarinis noted that 2018 was one of the best years in TravelBrands’ 15-year history, and reiterated its commitment to be an accountable, technologically innovative and efficient supplier for travel agents. H.I.S., the Japan-based multinational travel company, which also recently acquired Jonview Canada and Merit Travel Group, has operations in over 70 countries and 158 different cities worldwide. “The investment that H.I.S. made in TravelBrands is for a long-term vision. They want to continue to build on the global strategy. Canada was important to them and TravelBrands was a great target acquisition for H.I.S. to fulfill that need,” DeMarinis told Open Jaw. According to DeMarinis, TravelBrands’ centralized, single-user booking platform and its close relationship with travel agent partners were assets that made the company an attractive opportunity for H.I.S. 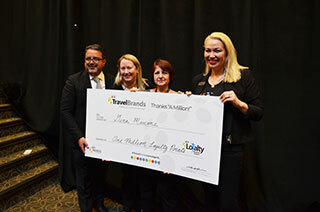 A surprised Gina Marcone of Transat Travel was awarded 1 million Loyalty Rewards points for her frequent sales of TravelBrands products. “Keep selling TravelBrands!” she exclaimed after accepting her cheque, valued at $10,000. Patty Woodward with Expedia Cruise Ship Centers said she “can’t wait” for the app and monthly payment feature to launch, adding that she “loves” using TravelBrands for its flight and package offerings. “They’re great to work with and have good prices, especially their exotic packages. They do most of the work for me,” she told Open Jaw. Cynthia and Alan Iskiw, husband-and-wife agents with Great Expectations Travel, said TravelBrands is their “first go-to” supplier to check when booking flights, cruises or accommodations for clients, highlighting the company’s diversity of offers and availability of its BDMs. 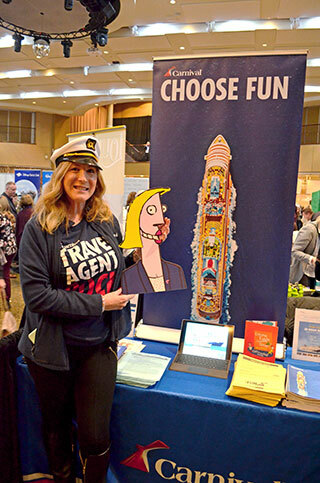 It was their second time attending a TravelBrands Agent Appreciation Event, which they say is a “useful and informative” occasion to network with exhibitors. “The suppliers that are here are the ones that we tend to use, so it’s really good for us to build contacts and network,” said Alan. The Toronto gathering was the first of six TravelBrands Agent Appreciation Events across Canada, with subsequent dates in Quebec City, Montreal, Ottawa, Edmonton and Vancouver.